Kuwait Magic is a shopping mall located to the south of Kuwait City. It has a moderately sized amusement park right next to it, and as we expected before visiting it was not in fact open. The reason is the Kuwaiti weekend, which unlike most of the western world occurs on Thursday and Friday. No amusement park in the world is likely to make a profit by opening to the general public on a weekday morning in school term. The key advantage of an empty park however came in photography; for the first time this trip we didn't have to worry about people walking into shot, and we were even treated to that rarest of pleasures, a clear blue sky. Most of the rides present were generic attractions, though there were a few oddities. First of these was a beautifully themed carousel style attraction called Orchestra which, as its name suggests, had small children sitting on top of assorted musical instruments. There was also a Superbowl which had clearly been imported from Japan, with the entrance, exit, and safety notice signs still in the original Kanji. One can only speculate as to how many Kuwaitis can read Japanese. Wageh told us yesterday about Marah Park Land and suggested we could easily get to it from Kuwait Magic. This might well have been the case if we had a road map showing where the park was. Unfortunately all we had was a handheld GPS and the destination coordinates, and while this might have worked eventually the navigation proved to be too difficult. Half an hour trudging through the sand was about our limit, and, admitting defeat, we flagged down a taxi. Unfortunately, we managed to find a driver who spoke only a small amount of English. Furthermore, it quickly became clear that he had no idea about where we wanted to go, and without the aforementioned road map and park address (preferably in Arabic) we were effectively snookered. After a few minutes of discussion it had become patently clear that we were not getting ourselves across. Then both of us realised something at almost exactly the same time. We were expending effort looking for a park with no operating coasters which was most likely to be closed anyway. 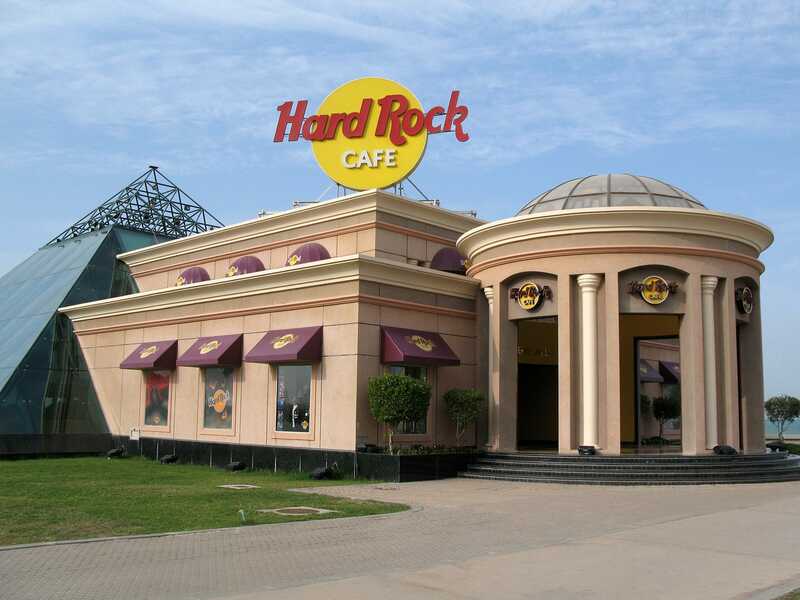 With this realisation in mind we decided to call it a day and head back to a safe haven, in this case the Kuwait branch of the Hard Rock Café. With a good twelve hours to kill yet before our flight we decided to wander back into Al-Sha'ab Leisure Park in order to take some photographs in daylight. Once again we decided mostly to chill for the evening, though we did try out two attractions; a moderately decent Space Shot and a rather good (and very long) dark ride by the name of Haunted Castle. The latter used an omnimover system and could clearly deal with hundreds of people at once, but we were the only two riding it tonight. In fact we arrived on the platform to find the ride stopped; the operator had us take our seats before he started the whole system running just for us.